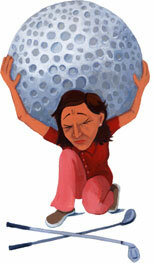 Thanks to reader Lara for passing along Emily Yoffe's entertaining Slate.com piece on taking up golf. Usually these types of essays aren't particularly original, by Yoffe brings a fresh perspective to the table. During my brief immersion in the world of golf, I determined that gloom is an essential golf component, as befitting a game that started on the moody moors of Scotland. When tennis players get thoroughly beaten, they come off the court sweaty and smiling. Their endorphins have shot up, and they look cute in their outfits. Even skiers being carried off the slope on a stretcher seem bizarrely thrilled about the elemental encounter between body and mountain. But golf induces despair. Take the observations in the book The Bluffer's Guide to Golf, by Peter Gammond, "The golfer [is] a miserable wretch at the best of times." "A golf match is designed to make as many people as possible unhappy." There are very few golf jokes, he writes, that do not mention "death and destruction."